The soft-serve ice cream shop on West Main Street in Hyannis always opens the first weekend of February vacation—no matter the forecast. This year, there was a blizzard warning, the Cape’s second this month, and eight to 12 inches of snow was falling across the region. But never mind the weather. On February 14, as scheduled, the shop opened up, and customers, bundled up in heavy winter coats and hats, lined up for soft-serve cones and sundaes—on special two-for-one opening weekend. Nichole Pepi and her daughter, Sydney, of Centerville enjoy ice cream no matter what the weather. Unbothered by freezing temperatures and winter precipitation, Sydney Pepi, 12, of Centerville, dug into her sundae with exuberance. “I say, it’s never too cold for ice cream,” Sydney said. She was enjoying vanilla with extra rainbow sprinkles. Par-tee Freeze has to-go service only, and customers have to stand outside to give their orders. But no one seemed to mind standing in line for ice cream, as fat snowflakes fell. Mackenzie said customers look forward to the shop’s first day no matter what the weather. “People want us to open,” Mackenzie said, noting that the winter opening has been a tradition for as long as the Par-tee Freeze has been owned by Steve and Sue Fedele. A blizzard warning is no match for the tradition of ice cream on opening day at the Par-tee Freeze in Hyannis for Bill Dalrymple of Centerville. In fact, opening day was busy all day, according to Mackenzie. Mid-afternoon, cars were maneuvering to find parking spaces in the large lot. The lot was full not only because of the line of customers, but because after being served ice cream, customers retreated to their parked cars to eat the ice cream. Customers were quick to explain why they line up for ice cream when it is 25 degrees and snowing. Tradition plays a big part. Two-for-one sundaes on opening weekend is certainly a draw. “It’s been non-stop,” Mackenzie said of business opening day. The shop is open from 10 a.m. to 10 p.m. Mackenzie said the snow would not cause them to close early, though running out of sundae containers might. 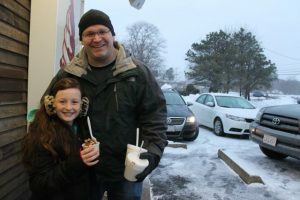 Getting ice cream was an adventure during a blizzard for Jason Peterson and his daughter, Chloe, of Marstons Mills. Last year, opening weekend also included a blizzard in the forecast. “We closed a little early,” Mackenzie said. But on this year’s opening day, the regulars kept coming in, lining up for ice cream in the snowstorm, as the staff of four were busy making sundaes and other ice cream confections for customers. “We have so many regulars. We ask them how their winter has been,” Mackenzie said. For Fleming, the “why” of going out for ice cream in a snowstorm was easy. “For the fun of it,” she said. She chose vanilla ice cream with hot fudge. Cory also had a sundae, but he said his usual favorite is called a “flurry”—an appropriate order during a snowstorm. People of all ages were enjoying ice cream opening weekend at Steve & Sue’s Par-tee Freeze, including Tim Martell, Johnny Richardson and Jamie Macintyre. A group of three 20-somethings were also lined up for ice cream. She was with Johnny Richardson and Tim Martell, both 23, both enjoying servings of ice cream. Macintyre said she lives a short distance from the shop and has been walking over since she was young. She listed three reasons for the shop’s appeal. As for reason number two, she said, “The Krunch coat is the best.” For the uninitiated, Krunch coat is a topping that the soft-serve is dipped into—this is a specialty at Steve & Sue’s. Serving up soft-serve with a smile during a blizzard on opening weekend. Reason number three sounded more serious, but she said it with a grin as she ate her ice cream. “Every year, I have seasonal depression from living on Cape Cod. This is the one thing people can look forward to at the beginning of the year,” she said. Macintyre said coming on opening weekend is also a tradition because her church group used to come to the shop the first weekend when she was a child for the buy-one-get-one-free special. Bill Dalrymple of Centerville said he has been coming to the Par-tee Freeze for opening weekend for 25 to 30 years. He purchased his two-for-one sundaes as he wife waited in their Jeep. He said they started looking forward to the opening day a few days earlier and cited “history” as one thing that brings them back year after year. Jason Peterson of Marstons Mills came with his daughter Chloe,10, to pick up ice cream for his parents as a Valentine’s Day present. For his parents, coming to Par-tee Freeze on Valentine’s Day is a tradition, but this year, they did not want to drive in the snowstorm. But Chloe did not seem to mind eating ice cream in the snow. As the wind gusted and snow whirled in front of the Par-tee Freeze on opening day, she was enjoying chocolate ice cream with peanut butter cup on top.